Various bits and pieces have appeared over the last quarter of the year; we'll be posting pictures shortly. Second Midland signal in the garden. 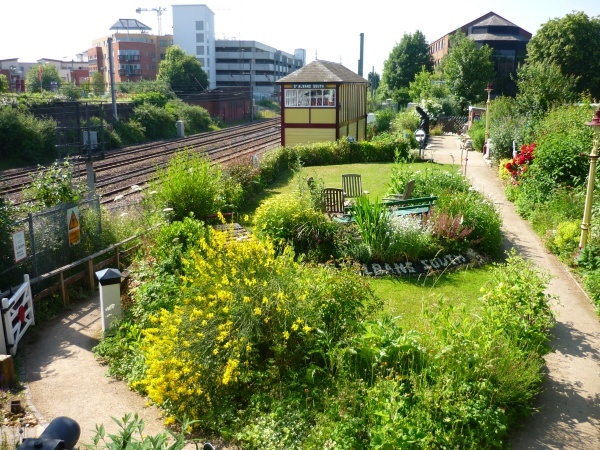 As a result of the resourcefulness, ingenuity and sheer hard work of the members involved, we now have a second working Midland Railway signal in the garden. The steel corrugated arm and the livery together would have applied from 1914 onwards, and represent a different era to the first signal, which is pre-1906. 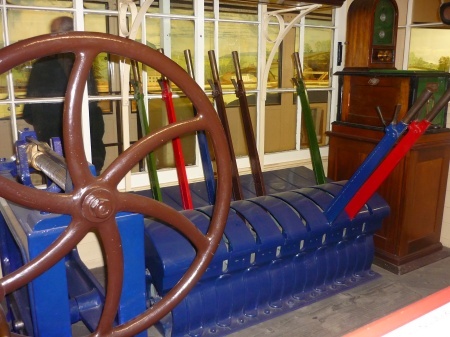 It is operated from the LNWR ground frame lever, and is weighted so that it will test the strength of our visitors who are willing to have a go! 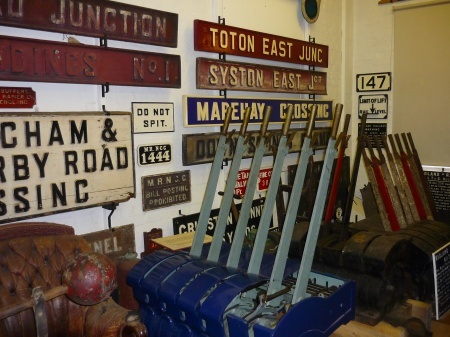 We are very grateful to the Roy Burrows Collection for the long-term loan of most of the signal parts, to Derby Museum for one of the cranks, and to the NRM for the post and finial. The last two working signalmen are reunited! During the August 11th Open Day, the last two signalmen to operate the box met up for the first time since Steve Lake handed over to Geoff Ryland for Geoff to work the last shift before the box closed in December 1979. Steve is on the left and Geoff on the right in the near photo, both are seen back on the frame in the right-hand photo with Geoff nearest the camera. In late July, the banner repeater on the down fast outside the box was replaced so that it can show green. See picture - as normal, horizontal means the main signal is red, and now white diagonal means yellow or double-yellow, with green diagonal meaning the signal is green. It seems that to achieve a fractional improvement in time-keeping, a train running on a previous yellow aspect can now accelerate that bit sooner on seeing the green banner rather than waiting to see the main signal. Also note the new symbol on the number plate that appears to mean that the banner is capable of displaying a green aspect. Thanks to the photographer for capturing (in the first image) the point where the repeater indicates red, but as can be seen, the signal is green. A horizontal bar indicates the signal is at red, is the rule. However, here the train has passed the repeater, but not the passed the main signal. (The train can be seen in the image). This temporary state ensures that the repeater gives the earliest warning that the sector ahead is occupied. Simply copying the main signal would delay this warning. 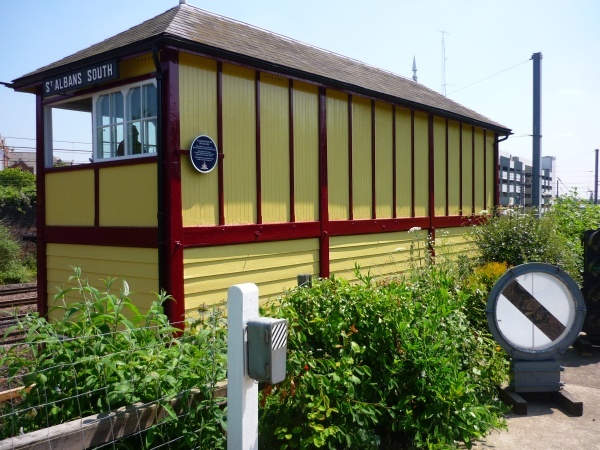 Like us, the signal box gets no younger, so many thanks are due to our volunteers for the recent repainting and clean-up. Along with new flagged areas around the site and the ongoing care of the garden and plants, the box really does look at it's best. The sunny weather only adds to the joy. We thought the snow and freezing weather had departed – hopefully for good - come Easter the freeze was back! Needless to say it did curtail open air work for a time, and the thaw confirmed that we must do something about our leaking front gutter during 2013 - as well as finishing the re-painting of the outside of the ‘box. 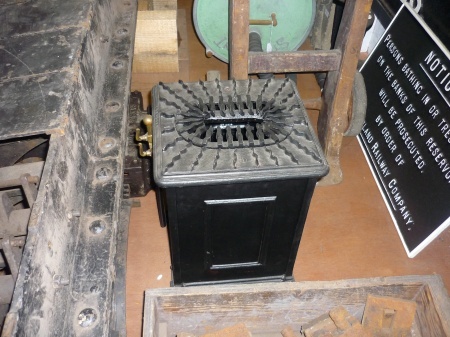 We have purchased a small brazier, which will prevent Greeters on the gate from contracting hypothermia in future! A ‘No Trespassing on the Railway’ sign has been cleaned and re-painted, and is now resplendent on the sleeper wall next to the running-in board. Jim Macdonald’s loaned, battery-operated, signalling demonstrator is working well downstairs, and excellently shows the interlocking at the rear. It is very popular with the children, and we hope to put it outside when the better weather arrives. Finally, it is good to confirm that on 29th January, as part of our ‘private’ visits programme, we received a group of special needs children from Watling View School in St. Albans. They really enjoyed their visit, and the teachers want to send two more classes! This is a really gratifying development in that, as well as being a growing heritage attraction; we are able to provide a valuable social amenity as well. The work on the Midland ground frame continues. The triple dolly is now re-painted and it is hoped to connect up in the next few weeks, and light it electrically. The lattice signal has been converted to a Distant, and will now also be worked off the ground frame in due course. In spite of the weather, Howard has stoically continued garden maintenance with a great deal of grass and weed removal on the path and ballast at the front of the ‘box. Also on our roll of honour this time are Michael our welder-in-chief, and Michael W, who has made a work bench out of the cage that came down from the NRM a while back (full of goodies), and who has patiently restored our 5 Tilley lamps. On the 31st of January a group of members travelled to Derby to view the Roy Burrows Collection. 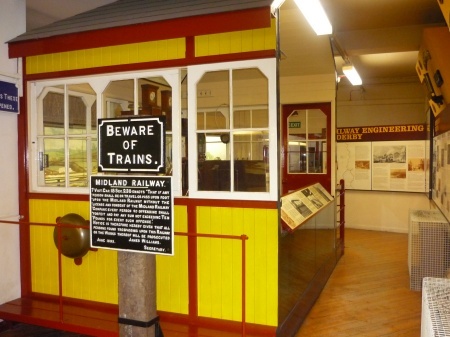 The 40,000 items represent the largest collection of Midland Railway artefacts anywhere in the world and were put together by Roy Burrows and are now stored in the Silk Museum. 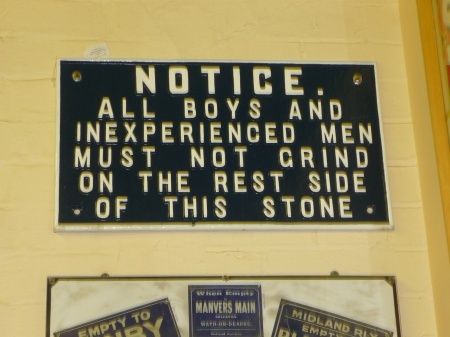 Due to shortage of finance Derby Council have been forced to close the museum and therefore the collection is know longer available to be viewed by the public so this was a rare treat. We were taken round by Roy and a couple of his volunteers and shown a variety of items from silver plate from St Pancras to Midland railway horse harness and Midland ground frames an amazing collection covering every aspect of Midland Railway life. 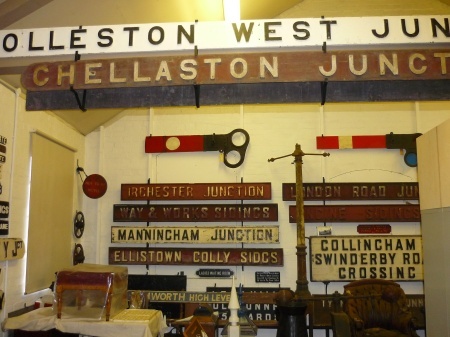 The highlight undoubtedly was an original signal box diagram from St Albans South Junction dated 1915 and if the collection trustees are in agreement we may have this diagram on loan at the signal box for all to see. Watch this space! !